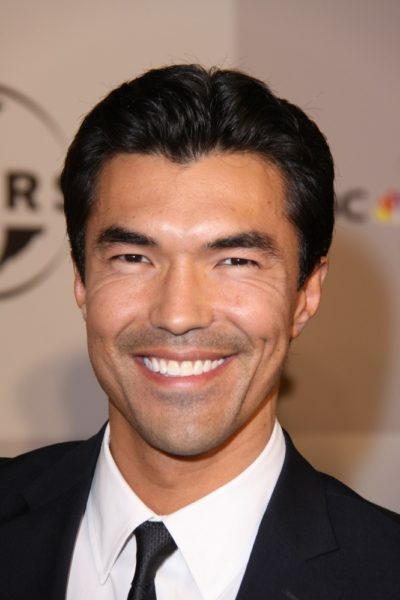 Ian Anthony Dale is an American actor. Ian is the son of Olga Guterres and Jack Dale (born John Byron Dale). His father is a professional ice hockey defenseman who played hockey at the Olympics. Ian’s father was born in Minnesota, of English, German, and French-Canadian descent. Ian’s mother was born in Kobe, Japan, and moved to the U.S. at the age of seventeen; aside from Japanese, she may have one quarter Portuguese ancestry. Ian’s parents are pictured here. I speak a skoshe Japanese, a little bit… My mom is Japanese. She tried teaching my sister and I when we were really little… It was really hard to catch. As an adult I’ve taken private lessons to try to pick up the language. It’s really hard… [My mother] Olga [has] a tough German lady’s name and she’s this cute little Japanese woman. I think she fits it in demeanor and toughness and I think she’s proud of it, too… I was one of the only people of color at my grade school and also my high school… my brothers are all white. We all share the same father but different mothers. Ian’s paternal grandfather was Landis Raymond Dale (the son of Raymond Dale and Katherine/Catherine Thilgen/Jelgen). Ian’s great-grandfather Raymond was the son of James Burton Dale and Laura Alice Oxford. Katherine was the daughter of Philip Thilgen and Annie, who were from Germany. Ian’s paternal grandmother was Lois E. Deslauriers (the daughter of Zephyr/Ziphyr Joseph Deslauriers and Erna/Enna M.). Zephyr was born in New York, to parents from Canada. Erna was born in Minnesota, to parents from Germany. Ian’s maternal grandfather was Felisbino Felix Antonio Guterres (the son of Antonio T. Guterres and Amalia/Amelia Marie/Maria Asae). Felisbino was born in Hyogo, Japan. Ian’s great-grandfather Antonio was born in Kobe, Japan. Amalia was born in Nara, Japan. Ian’s maternal grandmother was Beatriz Maria Kinko (the daughter of Ito). Beatriz was born in Yokohama, Kanagawa, Japan. His mother is a Portuguese citizen. Her race was listed as “Portuguese Colonial” at first, but it was replaced with “Japanese”. So it’s very likely she has a Portuguese father and a Japanese mother (her European-sounding name is another hint it’s that recent). His mother was born in 1909? Tough f–king genes. My bad, the birth year didn’t even cross my mind for some reason (the name and birth place seemed too fitting to not be her). It’s a little strange though, assuming the name is her actual birth name. Japanese-born, Portuguese surname, and Russian first name. The Portuguese were never in Japan to any large extent. She was named after her aunt. Anyway, the women in the record are Dale’s great-aunt and great-grandmother. Great! How did you piece it together? There was a woman named Beatriz Maria Kinko Guterres who died in California, and Dale’s sister is named Kinko. A “Dale family tree” on Ancestry.com lists Beatriz’s husband’s name. A family tree on MyHeritage lists Felisbino Felix Antonio Guterres’s parents’ names. BTW, Dale says that Olga is a German first name. I guess his mother is three quarters Japanese and one quarter Portuguese or something. Although it could be Filipino. Since Ian’s Japanese great-grandmother and her daughter (probably her son, Ian’s grandfather, too) were Portuguese citizens, it is most probably Portuguese. I suggest it is readded to his mother’s ethnicity, if Ian’s great-grandmother and her children were Portuguese citizens, and she married a man named Antonio T. Guterres, Ian’s mother is definitely part Portuguese. Have you started paying for an ancestry account? Or can you access the information for free in any way? I didn’t need an account to look at that, but ancestry.com is free at public libraries. Of course, you have to live on the right continent.